I’ve been taking Omega 3, 6 & 9 Fish oil supplements for the last 6 months and my supply has just run out. 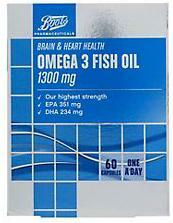 I decided I’d look into getting the best fish oil supplement which was easy to buy and not too expensive. And I also wanted to look into what makes a Fish Oil supplement good, and what might make them a waste of time! I know I don’t eat enough oily fish or nuts, so a supplement is just an insurance policy which will hopefully get me to get all of the nutrients I need (along with my Centrum Multivitamin). See more about Fish Oils here.